It’s so difficult to cook seafood. You leave it for one minute too long on the pan and it gets dry and chewy. One minute less and it is still too raw in the middle. It takes skills and experience to have the right, moist texture, the flaky consistency and the balanced flavor. And when it comes to pick a good fish restaurant, very often you have to compromise with the price and accept the fact your wallet will lose some weight (it’s an Italian expression to indicate you will spend a lot!…allow me that). I have been to Barcelona few times, and on my first trip I asked my friend and artist Riccardo, that knows the city quite well, where to have a good seafood meal. With no hesitation, he recommended a place he had tried before near La Sagrada Familia. 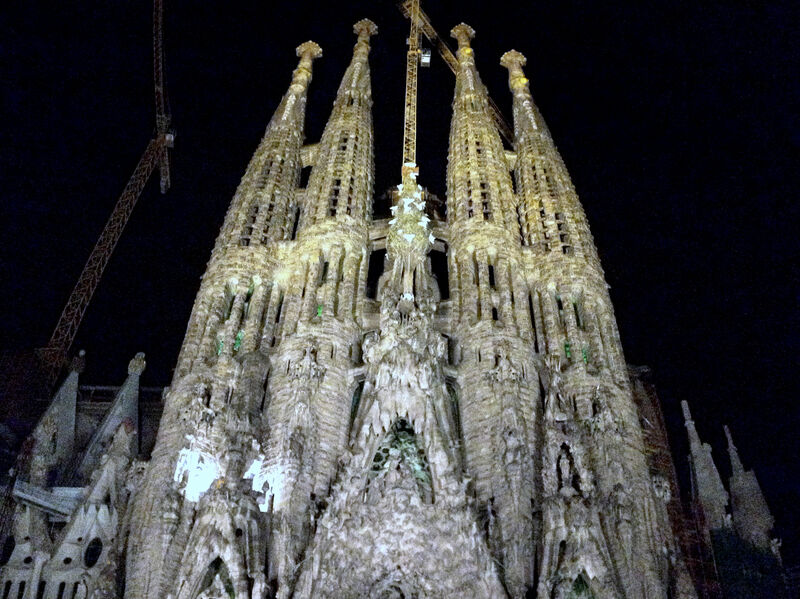 So one evening I took the tube from Parallel to La Sagrada Familia. Despite the late time, I wandered around that neighborhood, fascinated by that Basilica from the great architect Antoni Gaudì , that is still under construction after 132 years! During daytime the building is astonishing, and it is possible to admire the incredibly detailed statues and decorations, especially on the façades. But after sunset, the intricate effect created by the shadows of the decorations makes this Basilica even more impressive. Just around the corner from La Sagrada Familia I found the recommended restaurant, La Paradeta. Only once I opened the door, I immediately realized, with great surprise, the formula of this place. La Paradeta is a seafood self-service restaurant, with a very familiar atmosphere comparable to the one in a Italian trattoria. A large seafood shelf welcomed me at the entrance. Lobsters, tiger prawns, scampi, crabs, swordfish, calamari, squids, octopus, sea bream and much, much more. Some of them were still alive and moving all over the place. Ahhhh…the fish looked so fresh that I was tempted to order it raw. I picked a queue-token from the machine and started carefully checking the fish to decide what to eat. You can pick anything on that shelf. It’s tricky to order in weight measures, so I decided to go from “50g of that, please; let me see…a bit more; no, a bit more. Again a bit more….mmmm just an extra pinch of that” to “give me one BIG handful of that fish please!”. You can decide not only what to eat but also how you would like it to be cooked: mainly it’s roasted or fried. I wanted to try a mix of fried and a mix of roasted fish. 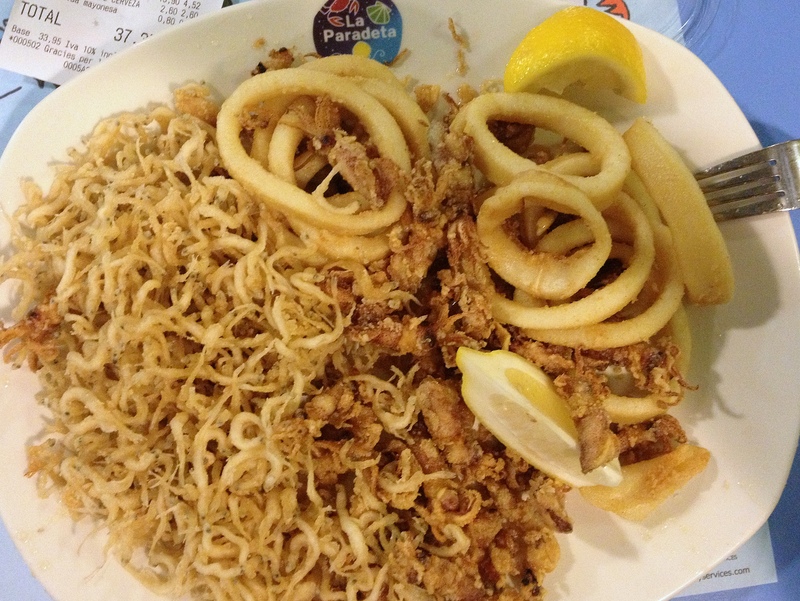 Calamari, squid and white bait were suggested by one of the two smiling girls at the counter. Then I added other seafood to have it roasted. And, of course, wine. The first dish arrived and…whoa! It was a lot! It was still smoking hot and at the first bite…heaven. The squid had crispy crust and a succulent, soft meat; so many times I had chewy squid that the tenderness of this one was really incredible. And the calamari and white bait were both crunchy and tasty as they should. I was still finishing this one when the second dish arrived. “A second one?!”. I had forgotten about it and I was already almost full. But I am so glad I did it! 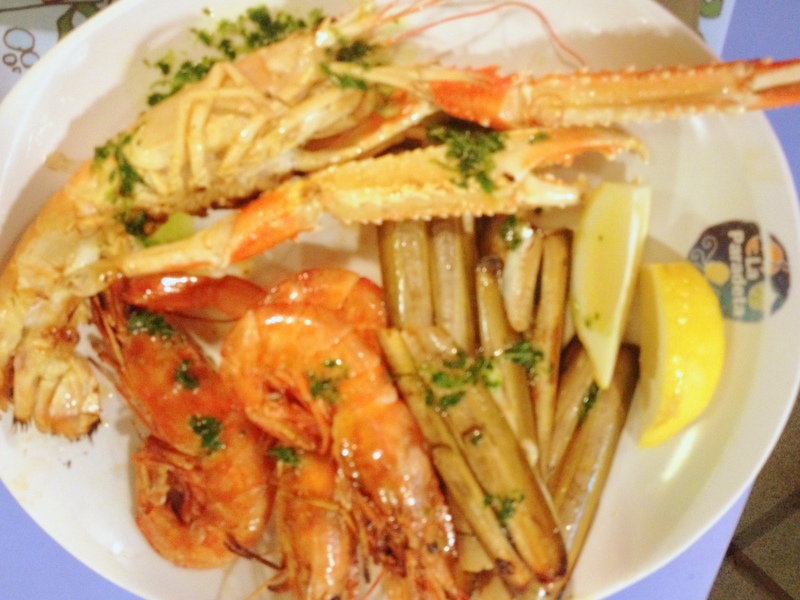 Roasted razor clams, scampi and tiger prawns. The razor clams were well seasoned with Mediterranean herbs and oil and very soft. The scampi were succulent and the meat very soft. My favorite though were the tiger prawns. Prawns, if not fresh, get very bitter around their head, both the meat and the juices. In this case the flavor was so good and the juices to tasty that prawns must have been really fresh. Plus they were perfectly cooked as meat was flaky and moist, as it should. What a dinner! Two girls sitting next to me couldn’t believe I was going to eat also that second dish and they wanted to take a picture. Proud of my food addiction, I let them, and posed with a big smile on my face. Smile, that derived from the amazing food experience I was having. And I spent just 37 euros for one of the nicest seafoodmeal I have ever had. Only once home, I realised La Paradeta near La Sagrada Familia is only one of the few restaurant of La Paradeta Chain of seafood restaurants that are scattered all over Barcelona. I promised myself one day I will try them all. And if you are planning a trip to Barcelona, don’t miss the opportunity of visiting one of their restaurant. If you are a seafood lover, you will love it. If you are not a seafood lover… I guarantee you will change your mind! Thanks for the tip! 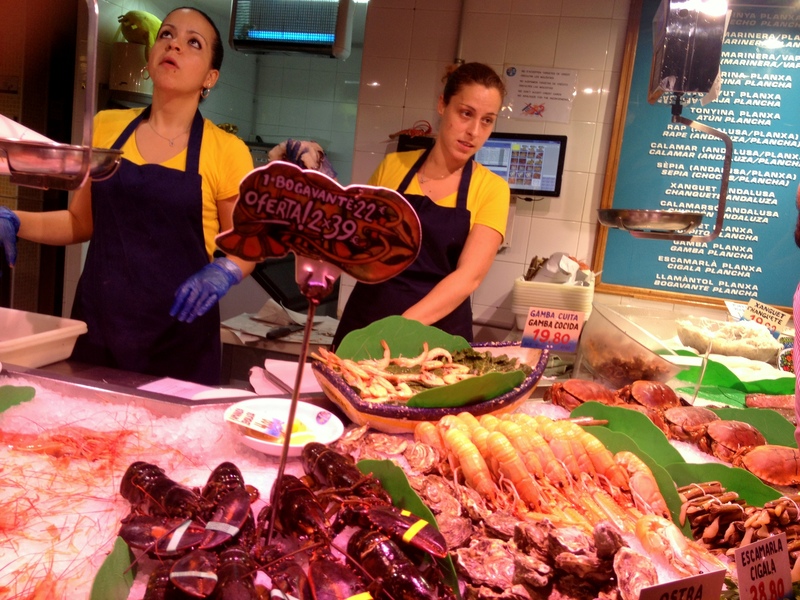 last weekend I went to Barcelona with some friends and, after visiting the Sagrada Familia, we took your advice …fresh and delicious fish at a very affordable price. Not to be missed!